I was happily surprised that I liked this cereal. When the first incarnation of Fiber One 80 came out in 2011, I didn't care for it. It was called Fiber One 80 Calories Honey Squares and it was bland, boring and a little bit gritty. This new cereal is leaps and bounds better. 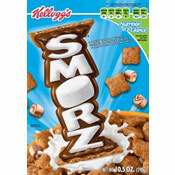 It has a big chocolate flavor that will remind adults of kid's cereals they grew up with. In many ways, it tastes more like Count Chocula used to taste than Count Chocula tastes today. 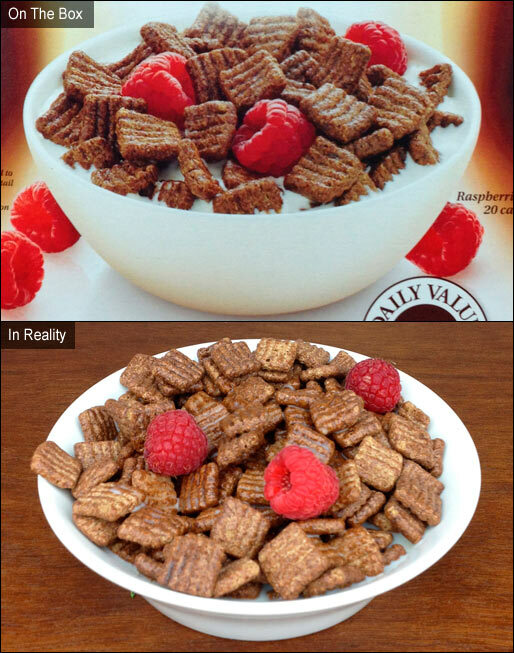 In the case of Count Chocula, they've reworked the recipe to make the cereal more healthy and the overall chocolate flavor suffered as more whole grain flavors crept in. Chocolate Fiber One 80 has chocolate as it's true focal point while the healthy grain flavors are sideline sub-notes - only to be noticed if you want to notice them. This cereal has just the right amount of sweetness. Considering that there's only 5 grams of sugar per serving, the amount of sweetness is surprising. The cereal pieces stay lightly crunchy in milk for up to 5 minutes. The intensity of the chocolate milk left in the bowl at the end of a serving is awesome. As you might presume from the name, Chocolate Fiber One 80 Calories has an impressive amount of dietary fiber at 9 grams per serving and the calorie count without milk is... you guessed it... 80 calories. If you have raspberries, I'd take the advice from the picture on the front of the box and use them. This cereal pairs really well with a small handful of fresh berries. Whether your a kid or an adult... health conscience or sweet-on-sweets... if you like chocolate cereals, this is one you should try. Nutritional Considerations: Each 3/4 cup serving has 80 calories, 1 gram total fat (0 saturated and 0 trans), 0 mg cholesterol, 130 mg sodium, 25 grams total carbs, 9 grams dietary fiber, 5 grams sugar and 1 gram protein. 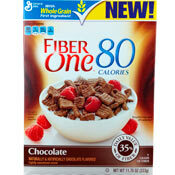 What do you think of Chocolate Fiber One 80? 25gm of carbs = 100 calories; 1gm of fat = 9 calories; 1gm protain = 4 calories. Total is actually 113 calories. A lot of cereals involving chocolate have entered the market lately. I remembered your review, confirmed the nutrition/fiber info on the label, and bought a box. The first tasting was with fresh blueberries & yogurt... Yummy! It also works well dry, as a crunchy snack. I plan to continue buying Fiber-One 80 Chocolate, often.